The nuthatch is true to its name: like an accomplished acrobat, it crawls effortlessly both up and down a tree trunk. Among birds, that is a unique skill. 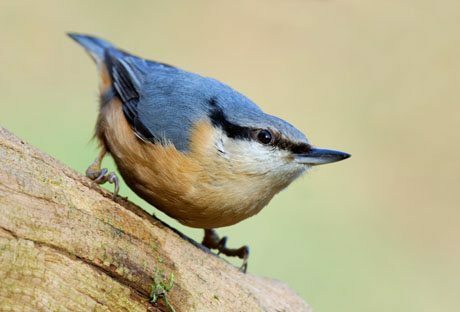 With the exception of Ireland, Scotland and much of Scandinavia, the nuthatch can be found throughout Europe. It feels particularly at home in a deciduous forest with many old trees. 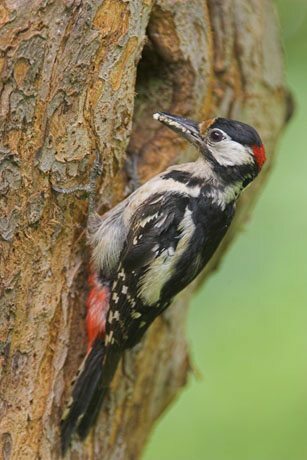 That’s because, during the breeding season from late April to July, the bird much prefers to use tree cavities or abandoned woodpecker holes to building a nest for itself. And as luck will have it, there is no lack of tree hollows and woodpecker holes in old trees. The menu of the nuthatch is made up primarily of insects, seeds, nuts, fruits, grains and berries. With its sharp beak, it secures tough nuts within the tree bark and hammers them to pieces. The short-toed treecreeper is the kind of small bird that you only notice when you really look closely. When the short-toed treecreeper sits still, it is almost impossible to detect, because its feathers remarkably resemble tree bark, its favourite field of action. ice are its main food source. To get hold of those tiny creatures, it must carefully seek them out amongst the crevices of the bark. Once a delicacy has been found, with its slender curved beak, it takes hardly any effort for it to pick apart the victim. 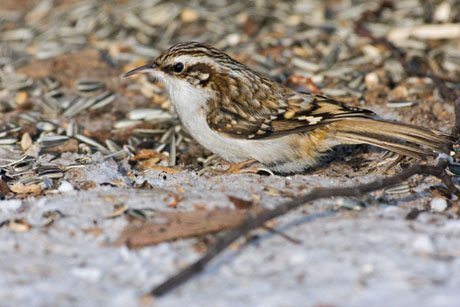 Short-toed treecreepers are also genuinely social creatures: in extreme cold, they crawl snugly together. From such a ball of feathers, sometimes ten or more tails can be sticking out. The short-toed treecreeper can be found mainly in Central and South-Western Europe, but can also be spotted in Belgium all year round. The hammering of the greater spotted woodpecker against the tree with its beak is undoubtedly one of the most typical forest sounds we know here. It is also the reason why woodpeckers are called the carpenters of the forest. Woodpeckers are true forest inhabitants. They can be encountered in deciduous, coniferous and mixed forests or (more likely) heard. Hammering with beaks strong as iron, they build a nesting cavity in a tree or go in search of food in the bark. Once they are on the trail of an animal, they deploy their secret weapon: their long tongue, which, in the case of the green woodpecker, can even be as long as 10 cm. At the end of the tongue, there are barbs, in which ants and other insects get tangled. Just like the nuthatch and short-toed treecreeper, the greater speckled woodpecker is also able to crawl up along a tree trunk. To do this, it makes use of its tail, for additional support. The middle spotted woodpecker appears mostly in lush, old, deciduous forests. Then the Sonian Forest is right up this bird’s alley, isn’t it? It absolutely is. In 2002, the first breeding event was recorded. It is now estimated that there are approximately ninety breeding couples in the forest. 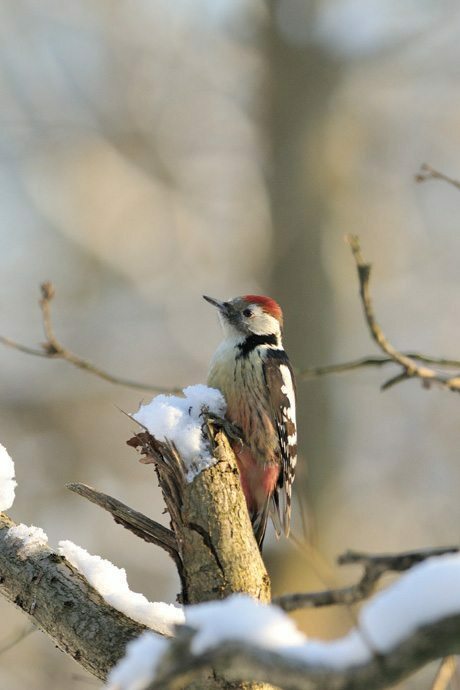 In the Sonian Forest, the middle spotted woodpecker can find dead wood to its heart’s content. It can rout there with its bill for tasty and nutritious insects. Seeds and fruits are also featured on the menu. This woodpecker is a quiet bird that seldom drums but will defend its habitat with a nasal, plaintive call. In soft and decomposing spots on old trees, it carves out its nest. In addition to its size, it is distinguishable from the lesser spotted woodpecker and the great spotted woodpecker by its pure red crown, completely devoid of black areas. The middle spotted woodpecker is therefore the woodpecker with the red cap! This spectacular-looking bird can grow to 45 centimetres. It is characterised by black plumage and red crown. It makes its home in tall-stemmed beech trees and populations of old Scots pines. 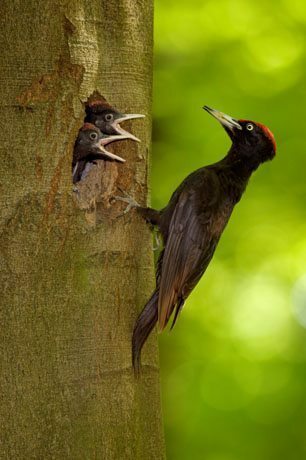 The black woodpecker carves its nest cavity out directly from a living tree, up to 15 metres high. It devours large quantities of insects, especially ants. You will frequently find traces of spots where it has been pecking at the bases of dead trees and large tree stumps. A few breeding pairs of black woodpeckers inhabit the SonianForest. This rare species is keen on extensive forests with a large number of old, tall beech trees. The black woodpecker is so rare that it is protected by the European Habitats Directive. 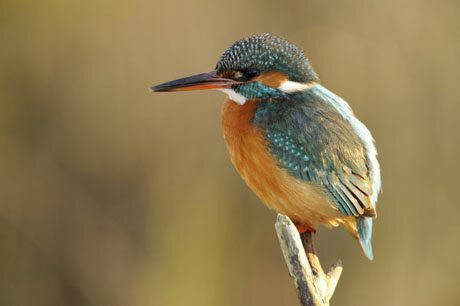 Neither grey, brown, nor black as are most birds in our region, but turquoise and bright orange; those are the camouflage colours of the kingfisher. Yes, you read that correctly, camouflage, and that fits the kingfisher like a glove. Its habitat: streams and rivers. Its favourite snack: fish and aquatic insects. As it flies over the water scanning the surface for some tasty prey, it is barely visible to its enemies, raptors like the buzzard and sparrowhawk. Ideally, it installs itself on a vantage point above the water. For hours, it will sit in wait until it catches a glimpse of the prey and dives into the water. Its long beak is more unerring than a harpoon at catching fish. Once the booty is caught, then it’s time to entice a female. The male does this by offering her a fish. This extraordinary bird is protected by the European Habitats Directive. The goldcrest weighs between 4 and 7 grams. And with a length of only 9 centimetres, it is the smallest European bird. It is especially fond of coniferous trees, such as the Scots pine, the larch and the Norway spruce. Although the Sonian Forest is mainly a deciduous forest, this small bird is also present here. With a little luck, you can see it fluttering skittishly from tree to tree. High in the crowns of the trees, on the thin branches, it looks for tasty treats, preferably insects. The goldcrest is very sensitive to the cold. It has a difficult time finding sufficient food, especially during snowy winters. 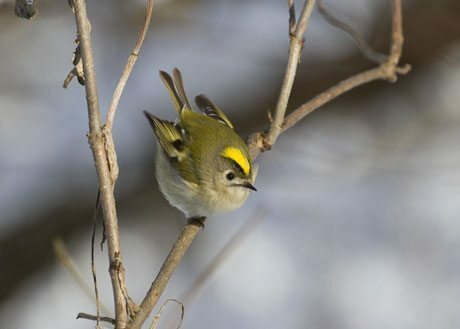 The harder the frost, the fewer goldcrests survive the winter. Luckily, in the Sonian Forest, the number of breeding goldcrests has gradually increased in recent years. 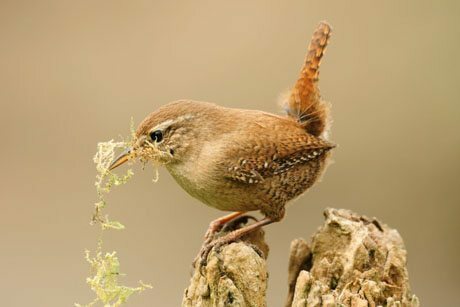 With a length of 9 to 10.5 cm, the winter wren is one of the smallest birds in Europe. On its menu are insects and spiders, and it often lingers near bushes and brambles. There it finds shelter, a place to sleep and protection. That’s where it makes its spherical nest, preferably near underbrush where it will find a lot of food. The winter wren can be found everywhere in the Sonian Forest, although you have less chance of seeing it in places with many beech trees. The dense foliage of the trees means that the lower vegetation – which the winter wren loves – doesn’t have a chance. You will have a better chance of spotting the bird around parks and gardens with hedges. The winter wren looks like a little brownish red ball when looking at it from below. Seen from above, it is whitish brown, drawn with fine dark brown stripes. In comparison with its stature, the bird is capable of singing very loudly. Its song consists of short ‘phrases’ that sound like loud, vibrating notes (trills) alternating with metallic sounds. The winter wren is entitled to its name: it is one of the few songbirds that also sing in the winter.